Conversion rate optimisation (CRO) is a crucial strategy for getting the best performance out of your website and maximising the return on investment (ROI) from your marketing spend. Traffic isn’t free and the more visitors who leave your website without converting, the bigger the dent in our profit is going to be. Highly-optimised pages convert a higher percentage of users, generate more leads and turn more visitors into paying customers. The only problem is it can be tricky getting a CRO strategy off the ground but this beginner’s guide to conversion rate optimisation is going to tell you everything you need to get started. Once you clarify what a conversion is and, then, what conversion rate is, you have everything you need to understand what conversion rate optimisation involves. A conversion is any profitable action users take on your website: buying a product, downloading one of your eBooks, signing up to your email list – anything you identify as being valuable to your brand. Conversion rate is the percentage of visitors on your site who complete an action you’ve identified as a conversion. If 100 people visit your homepage every day and four of them complete a conversion per day, your conversion rate for that page is going to be 4%. Conversion rate optimisation is a data-driven approach of testing changes to your website with the goal of increasing the conversion rates of your pages and key elements on these pages – eg: calls to action. A good CRO strategy is 100% data-driven – you’re not making design changes based on guesswork and hoping for the best; you’re pinpointing conversion killers through analytics, testing design improvements and proving their effectiveness with solid data. You put a lot of time, effort and money into bringing traffic to your website. Sadly, the vast majority of these visitors are going to leave your site and probably never come back again. This is very bad for your marketing ROI. Conversion rate optimisation aims to increase the percentage of visitors who take valuable actions on your website. It aims to make the most of your existing traffic and maximise the impact of all your inbound marketing strategies. Traffic: You need enough visitors coming in on a regular basis to run tests that provide reliable results. Analytics: The right data to spot opportunities for improvement and test design changes. A strategy: Clear goals and a strategic approach to implementing CRO. Assuming you’ve got the necessary traffic hitting the right page, your first move should be getting the data you need. The sooner you do this, the better, too, because more data means more accurate results. At the very least, you want conversion data for every page that has a conversion goal. This allows you to test design improvement and check how conversions are affected – hopefully, proving your design tweaks are having a positive impact. Bounce rate: When a user leaves your site without visiting a second page. Exit rate: When a page is the last one visited in a session. Time on page: How long a user spends on your page. Time on site: How long a user spends on your entire site. Pages visited: How many pages users visit before leaving your site. Page speed: How long your web pages take to load. Devices: How many visits you get per device type. You can use these metrics to help diagnose problems on your website. For example, if one of your important conversion pages has low conversion rates, high bounce rates, low time spent on the page and slow loading times, you know you probably want to make your page load faster. Likewise, if you see these metrics look much better on desktop than they do on mobile, it tells you improving page speed and mobile optimisation is a good place to start. To choose your first CRO tests, open up your analytics suite and see which pages are generating the most unique visitors. Now, filter out all of the pages that don’t have a conversion goal and this will leave you with a list of pages to optimise. It’s important to choose pages that generate plenty of traffic because these have the most room for improvement. Not all conversions are equally valuable to your brand, though, so traffic isn’t the only consideration. You also need to identify which conversion goals are most important and then choose which pages to start with. In this case, the top three conversions are clearly the most valuable and I would make free trial signups the priority here – because this is probably where the journey towards software purchases and pro version upgrades begins for most users. Free trials: Increase the percentage of visitors signing up to free trials. Software purchases: Increase the percentage of free trial users signing up to the paid version at the end of their trial. Pro upgrades: Increase the percentage of customers upgrading to the pro version. In this case, goals two and three are more about the quality of the software platform involved and the quality of customer service around it (eg: optimising your online support centre, troubleshooting, etc.). For the rest of this article, I’ll be focusing on goal one in that list because it brings our attention to parts of a website most businesses need to address. If the most important pages of your website aren’t generating enough traffic to begin with, your CRO efforts are going to have minimal impact – so make sure you’re getting enough visitor to the most important parts of your site. For landing pages, most of your traffic is probably going to come from search – a combination of organic and paid traffic. So you’ll need to up your SEO efforts and refine your paid advertising strategy if you’re not getting enough visitors to these pages from search. Not all conversions take place on the first page users visit, though, and you may find visitors aren’t reaching the most important pages after landing on your site – eg: your social traffic is browsing blog posts and then simply leaving without completing any valuable action. In this case, you’ll want to optimise the pages that to your conversion pages and increase the percentage of visitors clicking through to the next stage. On any page with a hero section – normally home page and landing pages – this is where you get across your first and most important message. First impressions matter and the impact you make upon users in hero sections defines how they interpret rest of your content as they scroll down the page. In most cases, you want to set users up with some kind of emotional trigger. Know what impact you want to make and test variations until you get the emotional response that sets people up for conversions. Calls to action (CTAs) are the most important element on any page with a conversion goal. This is where you literally tell your users to buy your products, request a quote, sign up to your newsletter or whatever else the conversion goal for each page may be. CTA copy: The most important aspect of any CTA is its wording and how compelling you make it for users to take action. Placement: Where your CTAs are on the page will have a drastic impact on conversions. Surrounding content: The content surrounding your CTAs – particularly above them – is crucial to priming users for taking action. Visibility: Your CTAs aren’t going to make an impact if people can’t see them – either because they don’t stand out or there’s too much else going on. These key factors are going to have far more impact than switching fonts and background colours. I’m not saying those design elements aren’t important but people don’t open their wallets because of font choices; they buy because you’ve gotten a compelling message across. Just about every conversion on your site is going to involve some kind of web form and you don’t want issues stopping people from converting at this stage. We’ve spent years optimising our own forms and we discovered multi-step forms can increase conversions by up to 300% and improve the quality of leads your pages generate. This is important because it’s not always the quantity of conversions that adds most value. A lower percentage of conversions from users more likely to turn into paying customers can be more profitable – so keep this in mind. Seriously, there are no downsides to having faster loading pages and countless studies have shown the negative impact slow pages have on conversions. 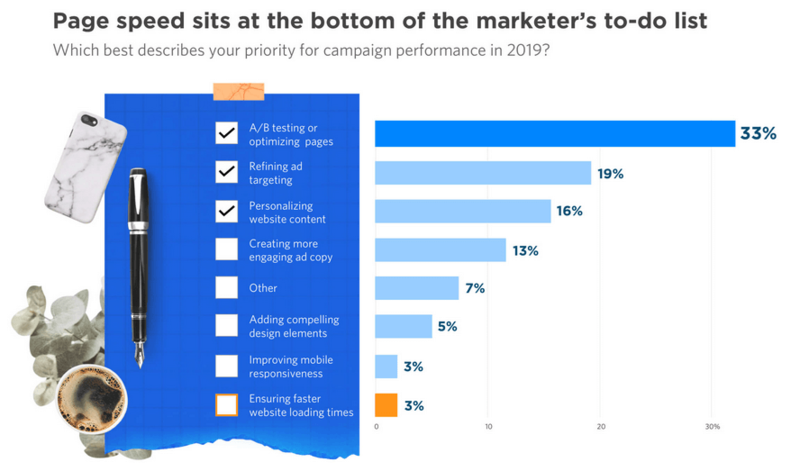 This should be a top priority for marketers but research from Unbounce earlier this year reveals loading times are bottom of the list of priorities for marketers. This is insane but you can use it to your advantage by taking the lead and optimising your pages for speed. If you want to stand out from your competitors for all the right reasons and boost conversion rates, this is a great place to start – especially on mobile. People buy from businesses they can trust and there are various ways you can show users their money is in safe hands. Before you add any of the specific trust signals I’m about to recommend, make sure the design of your site is up to scratch. Compare your site to the leading brands in your industry because this is what your visitors are going to be comparing you against. You want a modern, sleek and professional website that makes you look like an industry leader in every way. Customer reviews: Show new visitors how happy your existing customers are – just make sure you have a solid collection of positive feedback on platforms like Google Reviews, Trustpilot, etc. Expert reviews: If your brand, products or services have been highly rated by industry experts, your landing pages could be a good place to show it. Testimonials: Hand-pick feedback from your happiest customers/clients and showcase it on your pages. Unlike customer reviews, you can choose which feedback. Awards: Few things instal confidence quite like awards – great for products, services and brands alike. Statistics: If your product saves businesses an average of 136 minutes per week, increases productivity by 83% or reduces expenses, make sure you tell new visitors about it. Essentially, visitors are going to trust the opinions of people who have dealt with your brand before, industry experts and stats more than anything you can say yourself. Don’t go overboard with the trust factors, though – a combination of two or three from the list above should do it. Test out different combinations, designs and placements until you find the right mix. Once you’ve got the basics of conversion rate optimisation (CRO) under your belt, you’ll be ready to start thinking beyond individual pages and optimise entire sales funnels. With highly-optimised pages, you can focus on the journey users take as they progress along the buying process – both on your website and other channels. Your goal with funnel optimisation is to increase the number of users who stick to the right path and make their way to the purchase. For more information on this, take a look at our Funnel Optimisation 101 article to stop users getting lost along the way.